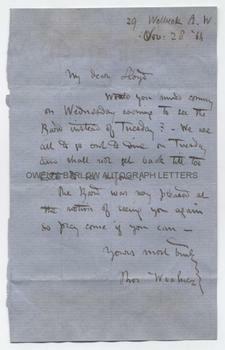 THOMAS WOOLNER Autograph Letter Signed. British (English) sculptor. One of the founders of the Pre-Raphaelite Brotherhood. ALS. 1p. 29 Wellbeck Pl. W. November 26th 1864. To "My Dear Lloyd". "Would you mind coming on Wednesday evening to see the Bard instead of Tuesday? We are all to go out to dine on Tuesday and shall not get back till too late to see anyone. The Bard was very pleased at the notion of seeing you again so pray come if you can." 8vo. 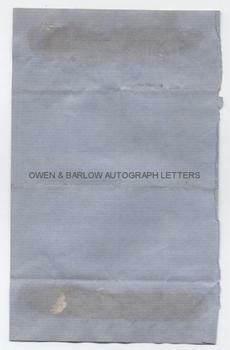 Approx 7 x 4.5 inches. Lacking integral blank leaf. Slight mounting traces to verso. Very good.